La Jolie..Luxury home with infinity pool, jacuzzi and spectacular ocean view. 4 bedrooms, 4 bathrooms with disability access, sleeps 8, A/C, near ocean. toilet, shower, Bathroom with disability access. There is an electric coffee maker and a french press available. Large deck aroud the pool. Mt. Irving Golf and Hotel is five mins. drive from La Jolie. Plantation Golf Club is 12 mins away. There is a bedroom/bathroom on the ground floor that is handicap friendly. First the one negative, which has been reported in at least one other review: the hot tub didn't work. Well, it did for one day, after a few requests to get it fixed. First fix got the jets working but not the heat. Second one got the heat working. After that day, it was only the jets that worked. With that out of the way, let me say that this is a really nice house that is outfitted exceptionally well -- maybe the most complete kitchen setup of any of the dozens of houses I've rented in the last several years -- and taken care of by a hugely friendly and helpful woman named Ulin (as well as several other people who did various kinds of maintenance, always very unobtrusively). The location is pretty fantastic. It's not *on* the beach, though I didn't have much luck finding houses in Tobago that are. But it's two blocks from a handful of restaurants and two more blocks from one beach and two more blocks from another beach -- and they're both *great* beaches. And it's maybe fifteen minutes from the airport/Pigeon Point and maybe 20 from Scarborough. We ended up meeting a family that lives just down the street from this house (and their ten-year-old daughter had a sleepover at our place!) as well as a ton of other super nice people. The house was a great home base for us. My only regret is that the local food was so good that we didn't end up cooking all of the food we bought at the grocery store (ten minutes away) on our first night!!! Thanks for your lovely response...we have had no end of problems with that dammed heater for the hot tub! !...we have changed it 3 times already! We believe the fluctuations in power in Tobago has something to do with it .All our appliances have surge protectors and sometimes it's just that it has tripped off. Hope to host you again if you choose to return to Tobago. Absolutely perfect location and accommodation. Kitchen is very well appointed, large comfortable rooms and a magical pool. Who could ask for more. I knew going in that I would enjoy my stay just from the helpful communications with Kathy, however it was far exceeded by all the cogs in the wheel that earned La Jolie the 5 stars. Helen catered to assisting with everything including car rentals, before we even arrived. Ulin was cheery and took such good care of us. There was a minor issue with the AC after the first night and within an hour of mention, was fixed by two very helpful - and fast - gentlemen. This occasion was very special to me, bringing a close knit group of friends to my island home for a milestone birthday and graduation. La Jolie was the perfect setting for it, and they've all enjoyed their stay, with a strong desire to come back. I couldn't be happier with the way things went, I'm honestly impressed and my family have found a new place to call home when visiting Tobago. - if you aren't planning to rent a car, taxis are ok but there's enough in the area to stay there for. If you desire you see rest of Tobago, car recommend - it's an easy drive to and from Crowne Point. - ample grocery locations in the little village below, within a 5 minute drive another well stocked grocery, and a Penny Savers on Milford Rd about 10-12 minutes from house. - there are tiny biting creatures in the morning vs evening, so grab a tube of our local Odomos, arm yourself with the Villa Zapper and you're totally fine. Or - stay in the pool, I mean why come out anyways!! Overall, as with anywhere, you get what you put into it. Generally in Tobago, you're treated well but treat the home and people with respect in return and you will get it back in spades and then some as we did with La Jolie. Thank you for the perfect start to a new chapter in my life - hopefully it's as good as this stay was. Thank you for a wonderful stay at La Jolie! It was very comfortable for my family, especially having a baby the environment was very clean which was really important to me. I would definetly recommend anyone to experience the spectacular ocean view, waking up to the relaxing sounds of the ocean waves. The kids enjoyed the salt water pool that was very safe. Such a great place well designed that captures all aspects of Tobago's natural beauty. Looking forward for another stay soon! Thanks for your lovely review, it was our pleasure having you. My family and I had a great weekend at the Villa. It's equipped with everything you need and the view is amazing. Best part of the stay was the pool and hot tub - we only left the house once the entire weekend! Thanks for letting us use your lovely rental. To put it simply: La Jolie surpassed our expectations. Everything was perfect and we had no issues at all. My family found comfort and convenience both in terms of the amenities and the location. We will certainly recommend and return. Thanks for your lovely review. It was our pleasure to have you at La Jolie, we hope to see you you again soon . La Jolie is located on the bluff above one of the nicest beaches in Tobago, Stonehaven Bay. La Jolie is only five minutes from Mt. Irvine professional golfing center and ten minutes from Plantation Golf and Country Club. Tobago's amazing beaches are only two minutes away with convenient access to PADI dive centers, we use Undersea Tobago out of Coco Beach Hotel ask for Derek Chung, sailing, deep sea fishing, snorkeling, and other water sports. Shops from supermarkets to kiosks, are all nearby including fresh fish every afternoon; further away are the Scarborough market, delicatessen and meat straight from the farm! Golf: Tobago has two beautiful golf courses, Tobago Plantations Golf and Country Club and the Tobago Mount Irvine Golf Course. The Mount Irvine Bay Golf Course is an 18 Hole Course with spectacular views of the Caribbean Sea, carved out amongst an old coconut plantation. Established in 1968, the Course is set within gently rolling countryside along the coast, with a view of the sea from every hole and an abundance of massive coconut palm trees. Like no other course in the world, the 18 hole PGA Championship course at Tobago Plantations has been designed to work with it’s stunning Caribbean backdrop. This British designed course takes you around mangroves and mature palm trees, to coastline holes offering views of Tobago’s capital in one direction and the Atlantic Ocean in the other. Wetlands and lakes are being nurtured around the course to encourage wildlife to add to the unique golfing experience at Plantations. 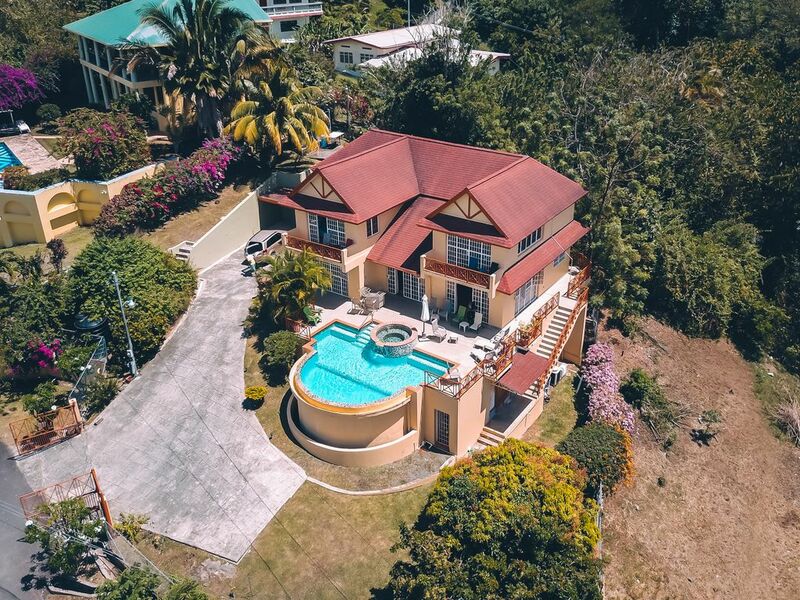 TT residents have a special rates of US$375 per night (Summer) and (winter), (Rate is connected to the bank exchange rate). Extra guests pay US$20.00. per person per night...max of 3 extra guests. TT residents can pay locally, instructions will be emailed to you. Special events eg. Jazz Festival, Carnival, Easter etc...standard US rates apply. 100% deposits will be returned if cancellation is done 30 days before the booking date,(SVC from Homeaway will be deducted)... EXCEPT for long weekends or special events in Tobago, which will be done on a case by case basis, A refundable damage protection fee ( US$100 /TT$700 CASH) must be given to the housekeeper on arrival.